LetterPalette was founded by Ana Prodanovic and Vedran Erakovic, type designers from Serbia. They have both participated in many projects involved with calligraphy, lettering and type design in their country and abroad. Ana is a teaching assistant at Faculty of Applied Arts in Belgrade, and she is also a typography teacher at one more faculty. Vedran is an assistant professor of Calligraphy and Type Design at Faculty of Applied Arts in Belgrade. In the last several years, they have both won awards in major international typeface design contests such as Communication Arts Typography Competition, Granshan Competition, Print Typography & Lettering Awards, etc. Their type designs are presented in books and magazines published by some of the world’s eminent publishers. In 2017 Ana and Vedran joined forces and started LetterPalette type foundry, with the intention to create and publish high-quality font families with distinctive and original design, both serifs and sans serifs, which support Latin and Cyrillic script, as well as OpenType technology. They also experiment with display styles, scripts and chromatic typefaces. 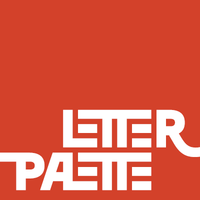 In years that follow, LetterPalette has a goal to offer you a large palette of beautiful letters!